Finnian of Clonard (Cluain Iráird) where there were up to 3,000 monks studying is called "the tutor of the Irish saints"
Summary of St Finnian, Bishop.Finnian studied in Idrone (County Carlow) and later in Wales, and on his return to Ireland he settled in Clonard, County Meath, around 520, where he established a famous school. His pupils, among whom were Canice, Colum Cille, and Brendan, were the initiators of the indigenous monastic expansion in Ireland. 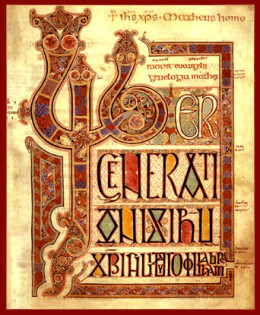 He died in 549 and is remembered as the tutor of the saints of Ireland. Finnian of Clonard (Cluain Iráird) is called “the tutor of the Irish saints”; Colmcille of Iona and Ciarán of Clonmacnois were among his students at his monastery in Clonard, Co Meath. The image shows St. Finnian and his pupils in a stain glass window at the Church of St. Finian in Clonard. 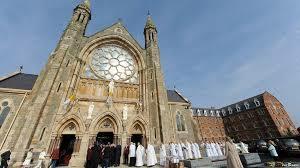 Clonard became a highly influential monastic centre until the diocesan structure was set up in the 12th century. Patrick Duffy tells his story. Finnian was born in the latter part of the fifth century at Myshal in County Carlow, on the slopes of Mount Leinster. His father was Rudraigh, an Ulsterman of noble lineage. His mother was a Leinster woman called Telach. 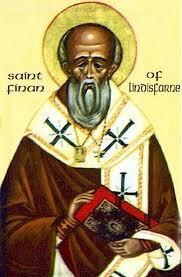 Finnian was educated first locally by Bishop Fortchernn. He soon travelled to monasteries in south Wales and may also have been at Tours in France. The monastery at Tours is noted for its austerity, for its sacrifice of physical comfort for spiritual gain. Finnian here is said to have befriended and studied under an elder called Caemen. In Wales he was in contact with the early British saints – Cadog at Llancarfan in Glamorganshire, David and Gildas. 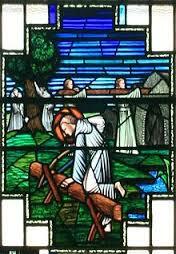 Although he may have intended to go to Rome, Finnian returned instead to Ireland, first to Aghowle near Shillelagh in County Wicklow, where King Oengus of Leinster gave him a site to build a church. From here he went north to Dunmanogue on the river Barrow, in County Kildare, and established another church. From here, he went to the town of Kildare, studying and teaching at St Brigid’s monastery. Finnian was held in high regard by Brigid, who presented him with a gold ring on his departure. The Penitential of Finnian prescribes penances for sins with a view to correcting sinful tendencies and cultivating the contrary virtue. The document shows wide learning and draws on the teaching of St John Cassian on overcoming the eight evil tendencies – gluttony, fornication, covetousness, anger, dejection, vainglory accidie(laziness), and pride. (The Institutes, Books 5-12). Finnian is said to have died in the great plague of 549-550. Many churches in Leinster and some in north Connaught were associated with his cult. By the early 10th century Clonard had blossomed into a large town with a round tower, a high cross and a new stone church. With the 12th century reform of the Irish Church that began with the Synod of Cashel in 1101 it became the centre of the diocese of East Meath. Today the site of the former monastic centre is located in the grounds of the Church of Ireland at Clonard. Recently the local Catholic Church of St Finian at Clonard has been renovated with suggestive artistic reminiscences of St Finian and the Twelve Apostles of Ireland.